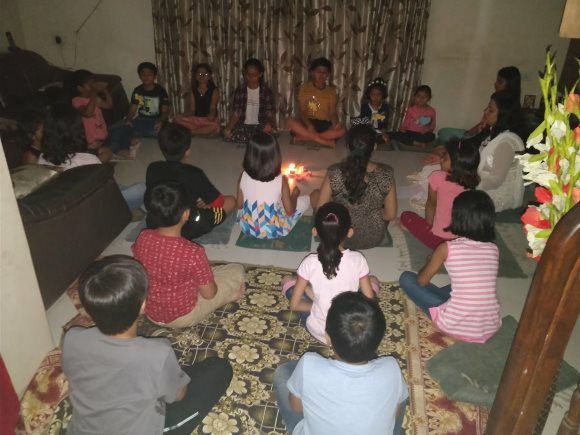 Awakin Kids Circle Emerges In Surat! Yesterday, we started the new journey of a "no exit strategy" ServiceSpace approach, with a local Awakin circle for children! It just so happened that circumstances cooperated, and organically the circle was initiated. 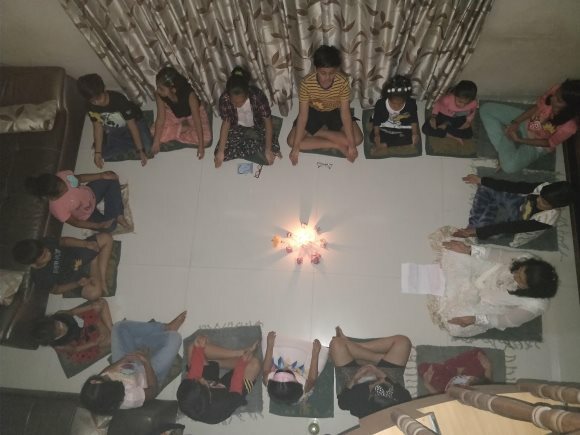 For our first circle, we had scheduled an hour -- first 20 minutes of meditation, then 10 minutes of story-telling, 10 minutes of sharing, then some prayers, and some food. What was happily surprising was that all the children sat silently without making any disturbance. For most of them, it would be the first time sitting. 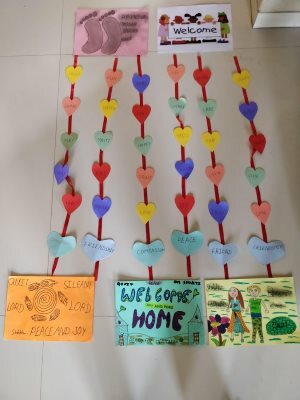 Manya, my younger daughter (6 yrs) made a colourful drawing, and even name tags for everyone. She had also written a story in her own words. No use of readymade media. Drashti gave me the idea of turning it into of simple handmade 'Heart decoration', that evoked the message of love. At the end, we asked the children, "Whoever wants to join for the next circle, please put your name tag in the bowl. Otherwise, keep it in the bowl." It was an unforgettable moment. Everyone signed on. It felt as if the universe supported us miraculously. We wanted to hold space in a pure way, and I feel so grateful to be a small instrument for this kind of service. I pray that we continue to proceed in this way. i am just so moved ! Great to know of this children's Awakin circle and the wonderful response. I am not surprised that they want to attend again to be part of the Awakin environment. The seeds have found fertile soil. Grateful to all who make this possible.